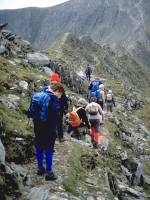 On the final day of the Mountain Goat guided fellwalking holiday of 1984, the group tackled Helvellyn (England's 3rd highest mountain at 3118ft) from Glenridding via the famous arete of Striding Edge. The weather was poor and these four images are the only ones of the few I took that are actually worth showing. Someday I hope to walk the Edge again under better weather. 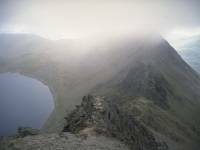 Striding Edge is technically an easy scramble but for many hikers and hillwalkers - myself included - it represents the limit of acceptable difficulty in terms of walking routes. 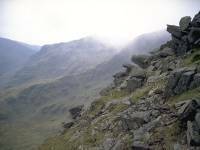 A narrow and rocky arete between Birkhouse Moor and Helvellyn proper, some half a mile in length, it features steep slopes (in excess of sixty degrees) each side, dropping to Nethermost Cove to the south and Red Tarn to the north. It is exceedingly popular on summer days and in the height of the season one has to queue to cross it. Seen from just above the "hole in the wall" west of Birkhouse Moor. The bulk of Helvellyn rears above but the edge itself cannot be seen yet. 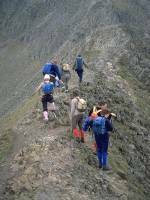 Hard work crossing Striding Edge's many bumps. I wouldn't want to be here with a strong cross wind or in icy conditions. A famous retrospective view that features in hundreds of photos (most of them far better than this one). Red Tarn is on the left and we have just tackled the twelve-foot chimney down from the western end of the Edge, followed by the unpleasantly steep pull up to Helvellyn's summit dome. The summit itself was in mist and I took no more photos that day.